The hotel invites you to the charming residence situated in the quiet Pszczyna Forest on the bank of the Paprocanskie Lake near Tychy. The hotel offers 7 rooms with a bathroom, telephone and satellite TV, 2 suites, 2 deluxe rooms and 2 rooms in a Hunting House. Guests will dine in an unusual and elegant restaurant serving tasty dishes of traditional Polish cuisine as well as hunter's meals. The restaurant consists of four lovely halls. Each hall has its own unique climate. The halls can be arranged to suit the needs and requirements of our Guests. In the hotel guests will have many occasions to actively spend their leisure time taking part in rides in coaches and chaises, bonfires and outdoor meetings, playing tennis and sailing. We organize conferences, banquets, symposiums in our 4 conference rooms. All conference rooms have internet access (Hot-Spot). â€˘ Portable devices: writing projector, slide projector, screen, video set, microphones, flipchart. We accept major credit cards: VISA, MASTERCARD, AMERICAN EXPRESS, POLCARD, DINNER'S CLUB. From the main railway station: through Tychy city centre to Fire Department-Tychy, highway exit in the direction of Bielsko Biala ( 2 km away from Shell). 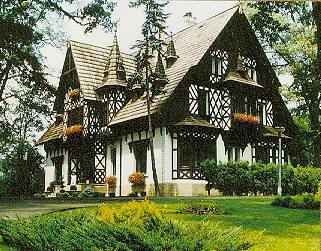 From Pyrzowice airport: in the direction of Katowice city to Tychy city and next to Bielsko Biala city.